I’m not going to lie, I used to DREAD dinner time. Among the chaos of figuring out what I wanted to cook, looking after my two small children, trying not to burn the food, and getting the table ready to go, mealtime used to be extremely stressful. 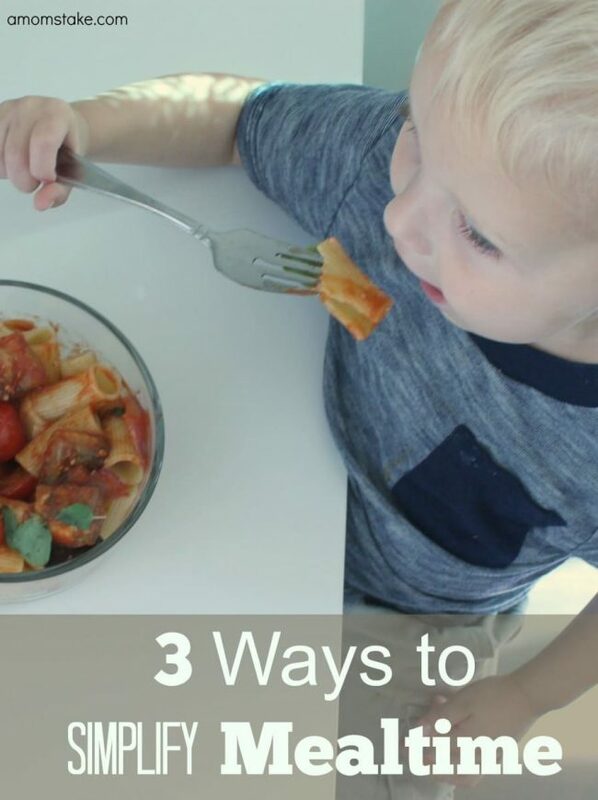 However, after practicing these 3 ways to simplify mealtime, I now look forward to spending time with my family around the dinner table. This is post is sponsored by Blue Apron. All opinions are my own. 1. Designate a time. Choose a specific time each evening that your family will sit down together at the dinner table. 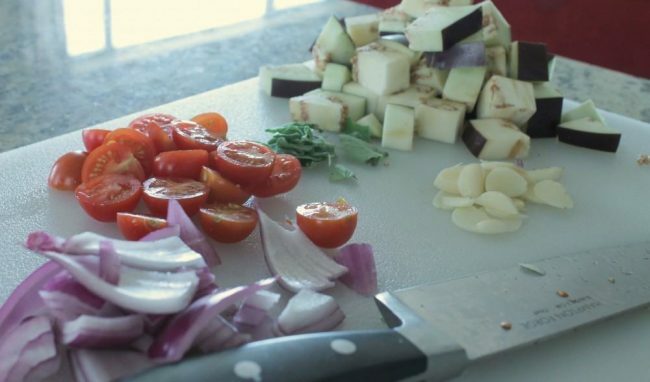 With this time in mind, allow yourself plenty of time for the food to cook. Having a set schedule each night truly makes all of the difference. 2. Make it a family affair. Delegate your mealtime tasks to other members of the family. 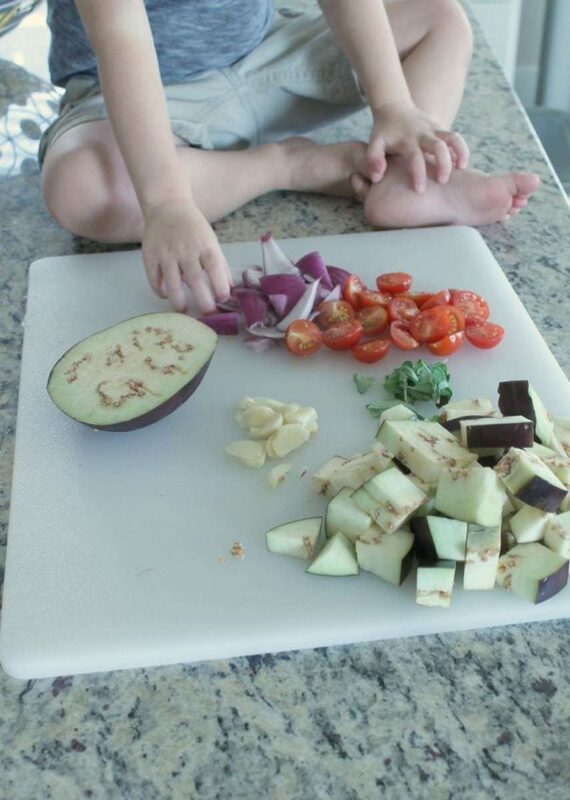 Allow your children to take turns helping cook the meal, set the table, do the dishes, etc. Not only does this help speed things up, but spending quality time together as a family sure makes things more enjoyable. Even though my son is just three, he LOVES to sit on the counter and help me make dinner. I wouldn’t trade this one-on-one time with him for anything. 3. Plan Your Menu Using Blue Apron. Nothing makes mealtime easier than having your meals planned for you. That’s right, using Blue Apron’s online service, you can select healthy chef-designed recipes and all ingredients are shipped right to your doorstep. Blue Apron’s perfectly packaged ingredient proportions cuts out weekly grocery shopping and wasted food. With a large selection of recipes all prepared in under 40 minutes, mealtime has never been easier – or more delicious! Blue Apron has truly simplified mealtime for my family. I love that my entire family can enjoy healthy and delicious meals in the comfort of our own home without having to think ahead of weekly menus or scheduling trips to the grocery store. Everything from Blue Apron extremely fresh and tasty. 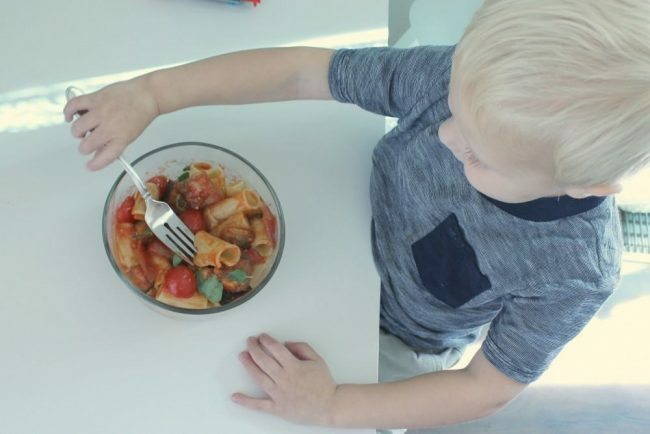 This last week, my son couldn’t wait to help me in the kitchen preparing Blue Apron’s Rigatoni Puttanesca. 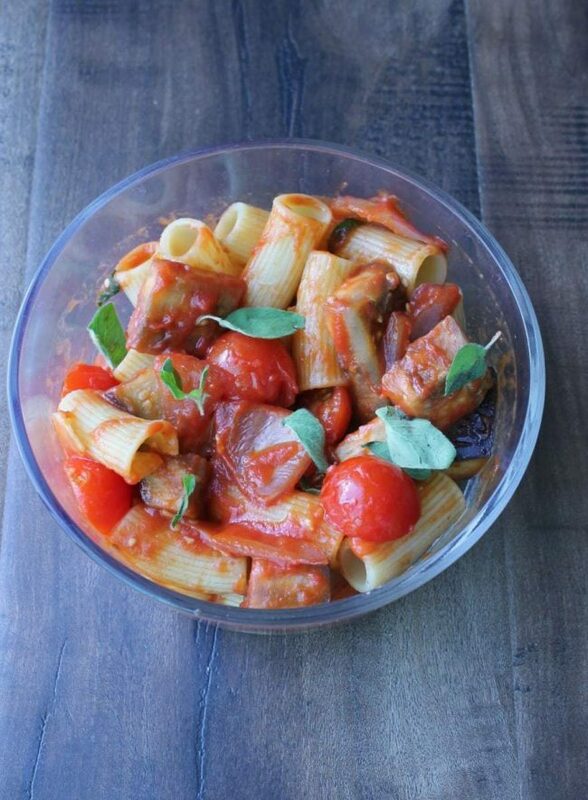 Using farm-fresh ingredients such as eggplant, cherry tomatoes, and oregano, our Riatoni Puttanesca was ready to eat in less than 30 minutes. As you can see, our family give Blue Apron two thumbs up! I can’t wait to try other recipes such as Thai Green Coconut Curry, Seared Steak and Roasted Potatoes, and Pork Ramen. Want to receive 2 free Blue Apron meals? Simply click on this Blue Apron link and the first 50 customers will receive 2 free Blue Apron meals with their Blue Apron order. Make your mealtime easier with Blue Apron. How do you simplify mealtime at your home? I want to try Blue Apron SO bad. It seems like a great solution for our busy family. That looks delicious. I heard about Blue Apron. I love that it makes everything easy. We have gotten Blue Apron meals a few times, and we love them! My daughter, husband, and I have a great time making them together as a family. I think the meal planning is the hardest part, takes so much time to figure out 7 days a week! I’ve never heard about blueapron. Is this something that you would consider using long term? We tried this too and now I’m a huge fan! We had Blue Apron two nights in a row! I could really use Blue Apron. I don’t mind cooking, but have a hard time just deciding what to make. I need new and tasty ideas. I like to get the kids involved with the cooking. They are always eager to try new foods if they helped to make it. Great tips! My kids love helping out with dinner! When I make out my grocery list I sit and think about the meals I want to make. Typically I try not to duplicate what we had the week before. Blue Apron sounds like a must have for working moms. Meal planning definitely makes things easier on my end. I just rarely take the time to do it. I like the idea of using a service like Blue Apron. It could definitely simplify our family’s mealtimes. We have a designated dinner time most nights and it really works for us. I do have to say that I have never heard of Blue Apron, before, so this sounds great. I heard of Blue Apron. It sounds like a dream come true! I love the idea of this service!! What a great way not to have to haul kids to the grocery store to. I am going to have to look into this! I simplify meals by planning a weekly menu & only going to the grocery stores once to get all I need for the week. In addition, I do a lot of one pot meals or a meal in the slow cooker. I would love to try Blue Apron sometime in the near future. To simplify mealtime in my family, I have been using my slow cooker. I also have been making basic, fresh, meals. I have heard great things about Blue Apron! I would love to try them. That rigatoni looks delicious! I wish we had a service like Blue Apron where I’m from. This would save so much time. Getting all the family involved in mealtime is a great idea. I love that your son helps you. Having a set time is so important to me. I always try to prep a little during nap time too. This would be so helpful on nights like tonight when I don’t know what to cook! This looks so yummy. Have to try this! We have actually had a few meals from Blue Apron. They were fast, easy and super yummy. I have always wanted to try one of these companies, but have yet to do so. It looks like their meals look delicious, we will have to try them soon. Blue Apron sounds awesome! I’ll always jump at the chance to find something that makes cooking easier. Yes, yes, yes! All my kids have their dinner time assignments and it makes things go A LOT faster.